This blog post has been contributed by my colleague Donna Hyland on behalf of Sharleen Daugherty. Donna “officially” retired from Hannover Fairs in 2002, but re-joined HFUSA last year to boost our sales outreach efforts for DOMOTEX and INTERSCHUTZ 2010, our fire-emergency technology show. Prior to leaving HFUSA – and her central position as the DOMOTEX project director – she fulfilled a long-held dream of bringing a group from the Navajo Nation and their beautiful hand-woven textile art to DOMOTEX. The project team in Hannover turned an area of the show into a virtual Navajo setting, complete with piles of rocks, hand cut fences to display their rugs, and “taxidermied” goats and sheep, all of museum quality construction. The exhibit also included sand paintings, pottery, silver and stone jewelry, figures, and natural dyed woven baskets. Experience a first-hand account from Donna and Sharleen of this great adventure. The loudspeaker blared, but in the din of airport noise it could easily go unheard. My heart raced. I felt waves of panic rush over me—just like the dreams I’d been having. But this time it was real; Minnie and Marie were missing. An experience of a lifetime, actually three lifetimes, had begun. 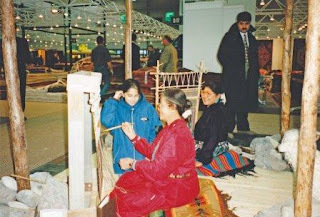 My company was representing the United States at DOMOTEX 2000, and I was accompanying two Navajo weavers on their first international journey. This was just one of many “firsts.” Minnie Hoskie and Marie Sheppard lived in remote regions of the Navajo Reservation, a 25,000 square mile area located primarily in the northeast corner of Arizona. The eighty-mile trip into Gallup, New Mexico, was the furthest the 65-year-old Minnie had traveled from her home in her lifetime. I have a book full of wonderful memories and photographs of our time in Hannover, Germany, but only the space to tell you a few. The enormity of the fair grounds made an instant impression. Our booth was located in a building easily the size of three football fields. It housed exhibitors of handmade weavings and carpets from around the world. During setup time it became apparent we were the only females in this exhibit hall, a minor inconvenience to the male exhibitors when Minnie walked into the men’s bathroom upon finding the women’s locked. Marie Sheppard looks on as Minnie Hoskie demonstrates her art. 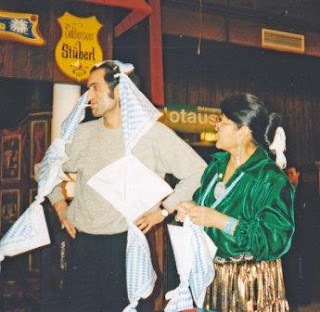 The hospitality of the German people also made an impression. Minnie and Marie were instant celebrities as they strolled the streets of the small town where we were housed in their colorful Navajo garb. On the night after our arrival, our hotel hosted a reception in honor of the two women; Marie had her first taste of a German delicacy, congealed duck fat spread on crackers. Cultural exchanges rank as the most memorable and meaningful. Throughout the exhibition there was a steady stream of visitors from around the world visiting our booth to watch the two women who sat on the floor in front of traditional looms. Language was never a barrier; the magic that came from their hands was all that was necessary. On the last day of the event an entourage of women and young girls dressed in burkas paraded into the hall and straight to our booth. They stayed for over an hour, taking turns at sitting alongside Minnie and Marie and admiring their silver and turquoise jewelry. And then there was the group from China who opened a brief case revealing bundles of $100 bills and wanted to purchase our entire exhibit—the summer hogan (name of a typical Indian dwelling), the stuffed life-size sheep and goats, the handmade loom stands, and all the weavings. The venture was foiled when they learned that I could not obtain hundreds of weavings every month, that looked “just like” Marie’s award-winning rug, for their Hong Kong market. These are memories of a time when people from around the world, representing hundreds of cultures and countries, came together in peace and harmony. They will never be forgotten. Contributed by Donna Hyland, DOMOTEX & INTERSCHUTZ Sales Manager, HFUSA.